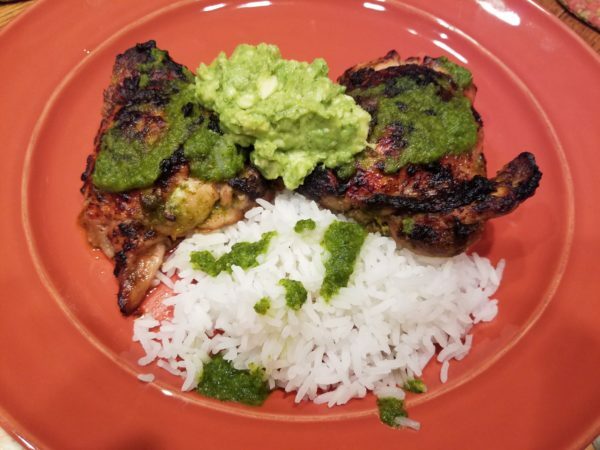 I LOVE a good chimichurri and I was in the mood for it when I came across a recipe for a citrus chicken and thought, "Why not combine the two flavor profiles??" If you're a fan of cilantro, you will love this. If your kids aren't adventurous eaters, just roast some plain chicken thighs with EVOO, salt, pepper and garlic powder for them, and keep this for the grown ups! Blend all marinade ingredients in a blender until smooth. Season to taste. Put 1/4 cup of the marinade aside. Put chicken in a ziplock bag. Pour in the remainder of the sauce and marinate in the refrigerator for at least 20 minutes. Line a baking sheet with foil. Remove the chicken from the bag and place onto the foil. Discard the remainder of the marinade. Bake for 35 minutes, or until cooked to 165°. Combine the chopped avocado with a tablespoon of the reserved sauce. Add salt & pepper to taste. Remove chicken and serve on a bed of rice. Drizzle with sauce and add some of the avocado mixture. *This would also be great served with some black beans, but I was all out. It would also make an excellent marinade/sauce for fish tacos. If you use fish, only marinate for about 20 minutes, as the citrus will begin to "cook" the fish if left much longer than that.